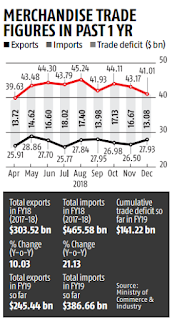 India’s trade deficit narrowed to the lowest level in 10 months as exports remained flat and imports contracted in December due to a fall in global crude oil prices. Imports fell 2.3% to $41 billion in December. 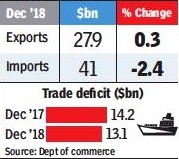 A contraction in imports is seen to be a negative for the economy as it provides the required inputs and raw materials to keep factories running. 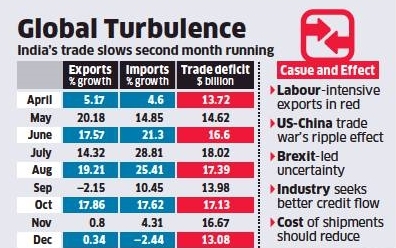 The 0.3% rise in exports during December was the slowest pace of expansion in three months. The slowdown in exports coincides with the surprise flat growth in industrial production in November, which grew 0.5%. 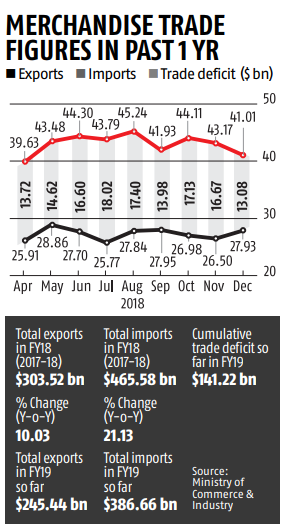 The fall in imports was attributed to a slowdown in oil imports, which were estimated to be 3.2% higher at $10.7 billion in December, with the government pointing out that Brent prices were lower by 12% last month compared to December 2017. Non-oil imports too were just 4.3% higher at $30 in December. Import of gold contracted by 24% to 2.6 billion in December 2018, official data showed. Exporters suggested that too much should not be read into a month’s numbers and attributed it to global factors.